Harry Dresden is a Chicago-based private detective, working for not-terribly-much-money - mainly with the local police. He's also a wizard on probation. For murder. Harry Dresden's master - later discovered to be a black magician - died in mysterious circumstances, and the Council isn't certain whether Dresden acted in self-defence - and after a second apprenticeship, he's still being watched. So when a gruesome murder investigation and a missing husband land on his doorstep (though not literally), Harry's seeing a profit margin (and a large one) - but caution is of the essence. Any dubious magic is suspect, and with the Council at his door, Harry is going to have to step carefully. As you can see, it's fairly easy to recognise the entwined cases - especially in a novel as slim as Butcher's. Nevertheless, it's a compelling story, and told well. Reusing elements from popular culture and mythology, Dresden's magic system nonetheless possesses the necessary factor for detective fiction in which magic plays a major part: it's consistent. Especially in light of future books, Dresden's system maintains almost complete consistency, which is, of course, essential. Because the reader doesn't like to be cheated with this - a major feeling in Green's Haunting the Nightside, where the unchecked expansion and contradictory nature of his system/world mean that there is no possibility of reader insight into the clues. Here, there is - but that's not to say there aren't flaws. There are. Firstly, as aforementioned, the twinned cases. Secondly, some characters are a little stereotyped - for some later characters, characterisation is rather weak, although for Butcher, we must make a concession for low page count. The prose isn't perfect - there are mistakes -, but it's there, and there are few - if any - of the more prosaic tics. Altogether, it's a fast-paced, sympathetically-characterised, compelling read - and that's, after all, what counts. 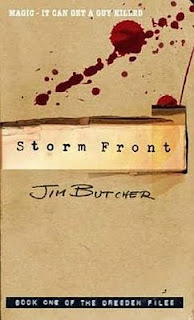 I have heard about Jim Butcher but never had a chance to pick up one of his books. Thanks for posting this. I have to read one of his sooner or later!